MAIN DESCRIPTION Galley Properties are delighted to offer to the market this beautiful three bedroomed bungalow in the heart of beautiful rural Wadworth. As part of an exclusive development of just seven houses, nestled in a quiet cul-de-sac, this lovely home is set in stunning mature gardens. Featuring, well proportioned rooms, a gorgeous conservatory the full width of the property, fitted wardrobes and furniture to two bedrooms, en-suite and large office/ craft room ideal for working from home or for the hobbyist. Wadworth is a lovely little village, nestled between Doncaster and Tickhill, with all the benefits of rural living, but still less than ten minutes away from the A1(M) and wider motorway network. There are local shops, a primary school, post office and pub, and super views over open country side. HALLWAY Reached through a wood effect uPVC double glazed front door, the welcoming hallway is floored with a combination of hard wearing laminate and soft green carpeting. There’s a generously sized built in closet too, ideal for all the coats and shoes that tend to accumulate around the front door! LIVING ROOM 19′ 4" x 11′ 9" (5.9m x 3.6m) The spacious lounge is a light, airy living space, with a wide north facing window at one end, and glazed French doors to the conservatory to the south. It’s got a central ceiling light, and two wall sconces, one either side of the traditional marble effect mantlepiece that’s fitted with a traditional coal-effect gas fire. Cream walls with white skirting and coving pair with a neutral carpet to provide a relaxing atmosphere. It’s such a versatile room, with tons of space for a variety of layouts. KITCHEN 12′ 9" x 9′ 10" (3.9m x 3.0m) Super airy and inviting, the kitchen is truly the heart of this home. Fitted with a good range of birch effect fronted cupboards and a lovely sea green counter top, it’s a real cook’s delight. With a four burner gas hob set into a long stretch of counter, giving ample room either side for food prep and dinner assembly. Under the counter is plumbing for a washing machine. The stainless steel sink and mixer tap sits under the window which looks out into the conservatory and to the stunning garden beyond. Next to the window is a fully opaque glazed door, letting in plenty of natural light. At the other end of the kitchen is the integrated oven, with space for a fridge freezer, and opposite the hob is a feature built in welsh dresser, complete with glass fronted display cabinets with tons of storage for those objects that deserve to be flaunted. On the floor is co-ordinated cushioned flooring, in cream and soft green, which ties the whole kitchen decor in together beautifully. It’s a great room, with everything the busy cook could wish for. CONSERVATORY 17′ 0" x 11′ 1" (5.2m x 3.4m) Without doubt, this room is one of the many highlights of this house. The beautiful conservatory sits on the south side of the house and gets the best of the sunshine. Finished with wood effect double glazing on a low brick wall, it’s spacious and inviting. Rich cream tiles make for a durable, attractive and easy clean floor and the long radiator means it’s a comfortable space even in winter. There are fitted blinds around the vertical windows, and there’s tons of space for all manner of uses. Double doors lead out into the spectacular back garden and it’s abundance of colour. MASTER BEDROOM 14′ 1" x 9′ 10" (4.3m x 3.0m) The master bedroom is a tranquil, traditional room, decorated in warm cream with a wealth of fitted wardrobes and cupboards, bedside units and a dressing table. There’s a central ceiling light, power points and a radiator, and the east-facing, wide window lets in the best of the morning sunshine. It’s such a lovely room, with plenty of space for a double bed. A side door leads to the en suite. EN SUITE 9′ 10" x 3′ 7" (3.0m x 1.1m) Fully tiled to ceiling height in neutral tone tiles, the en suite has a low-level WC, pedestal wash basin and chrome and glass shower stall. A wood effect, uPVC, opaque double glazed window faces north and there’s a chrome towel rail too. Pale green carpet matches the master bedroom in this spacious and practical en suite. BEDROOM TWO 11′ 9" x 8′ 10" (3.6m x 2.7m) The second bedroom also benefits from a lovely set of fitted wardrobes and drawers, with ample space for a double bed too. It’s a cosy room, ideal for relaxing in with a central ceiling light, radiator and power points, and a west facing window. Access to the loft space can be found in here too. BEDROOM THREE 10′ 5" x 9′ 6" (3.2m x 2.9m) Bright and cheerful, the third double bedroom is currently being used as a separate dining room and benefits from the same neutral decor as the rest of the house, cream walls and a soft green carpet. 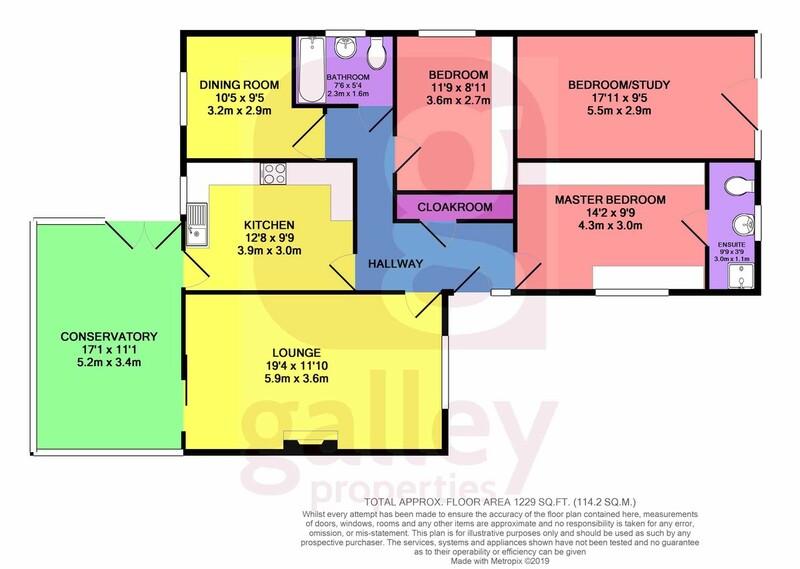 There’s plenty of space for a double bed and furniture or a table and chairs, although it could would make a great home office if the new owners so chose. With the requisite radiator, central ceiling light and power points, it’s a versatile room that gets lots of plenty of sunshine. FAMILY BATHROOM 7′ 6" x 5′ 2" (2.3m x 1.6m) The family bathroom is traditional and finished with cream tiles to ceiling height making it low maintenance. The suite consists of a panel sided bath, pedestal wash basin and low-level WC. A soft green carpet matches the hallway and bedrooms, and there’s a wood effect uPVC window. STUDY/CRAFT ROOM 18′ 0" x 9′ 6" (5.5m x 2.9m) This really useful space used to be the garage, but it’s been converted into a much more user friendly room. The garage door has been replaced with two windows and a lovely wood effect uPVC double glazed door, and there’s a co-ordinated carpet under foot. The walls are white, and an eclectic range of cupboards, shelves and desk space adorn the right hand wall and across the back of the room for lots of useful storage. It’s really such an amazingly adaptable room. Currently used for storage, it could make a fabulous space to work from home, craft room, teenage hideout or even a spare bedroom. EXTERIOR SPACE FRONT GARDEN Surrounded by a low brick wall and bordered by the sloping, block paved driveway, the front garden is packed with mature shrubs, cheerful heathers, spring bulbs and colourful planting that creates a magnificent kerb appeal. BACK GARDEN The stunning back garden is a gardener’s delight. Chock full of amazing plants, mature shrubs, spring bulbs and evergreen plants, there’s something of interest for every season. Paved paths wend between planted beds, and there’s trellis, obelisks and an archway for the climbing plants and a potting shed provides a practical space to nurture seedlings. A beautiful glass fronted summer house sits at the end of the garden on an elevated position and provides a quiet oasis to escape to! Finally a huge variety of spring bulbs are currently blooming in all their glory, and we definitely recommend an early viewing to make the most of the beautiful display. Nestled in a Quiet Cul-de-Sac,Set in Stunning Mature Gardens.